Send your kids back to school in eco-friendly style with a super cute Ecozoo backpack! The winner will receive his/her choice of one Ecozoo backpack — either the elephant, pig, panda, or puppy. (Valued at $29.99) All creatures are made of 100% organic cotton canvas and feature padded straps and internal pockets. Read more about why the adorable Ecozoo series offers the best green, non-toxic backpack for your child! 2) Leave a comment on this post telling us one thing you’re doing to green your child’s back to school regimen. Here in Dublin, lunches are provided by the school: sandwiches, fruit, water and milk in a paper sack. I got so fed up of seeing discarded water bottles and milk cartons littering the pathway around my kids' school everyday, going to general waste trucks, that I started a special Green Bin competition to see which class could recycle most. Now there's hardly any waste and the children have shown so much interest we're starting a Green Club when school resumes in September! Hooray! My son started a recycling program at his school, and I'm packing wholesome, waste-free lunches everyday with reusable snack bags, whole fruit, and a sigg thermos with water. I subscribe to your newsletter and something I am doing to "green" my kids back to school regimen is having them reuse their folders, markers, crayons, etc. from last school year. There is no reason to buy new ones and throw the others away just to have fresh ones for this year, when there is nothing wrong with their ones from last year. I'm sending my son to school with re-usable snacks and sandwich bags. This school year we are going to start packing our daughter's lunch in a bento box. She loves the tiny containers it holds...and I love the fact that we are "going green" by washing them and reusing them! Sounds like a great contest. Our daughter is going to a neighborhood school this year that she can walk to everyday. Better for the environment and good for her health! I don't use throw away lunch wraps but eco wash & reuse wraps for sandwiches etc. Less plastic to pollute the environment. I am on the healthy snack committee at my daughter's school. We prepare organic goods and encourage the kids to bring reusable containers for their lunches. My daughter would go nuts for the puppy backpack! This school year, I will continue to send my child to school with a reusable lunch bag and drink container, but I am more excited about what I will be doing this year in my own classroom. I am a teacher and my students will be learning via SMARTboard. This means that my lessons will be paperless! The SMARTboard allows me to bring the world to my students without all the paper and clutter. They can learn, interact, and even take quizzes. I'm so excited about this new adventure. i am packing both of my kids lunches, and we are planning a clothes swap with a couple familys so we dont have to throw out of clothes and other people can use. Since three years ago, we have been practicing recycling at home. One of the challenges is for the children to continue on practicing green habits when they are out of the house and continue to recycle and reuse in school. We segregate garbage in the house and also encourage reuse of school items. This backpack would be for my nieces because I don't have any children yet. My sister is going through a nasty divorce right now and I want to get something for her children that will make going back to school extra special. I plan on packing it with reusable lunch containers so that they can take their lunch to school in special containers no matter which parent's house they are staying at. we use re-useable containers for lunches and bought non-toxic school supplies. Definitely trying to decrease waste with lunches this year! Newsletter subscriber, and I no longer buy disposable drinks at all. It's all about the Thermos! I also bought a nice eco-friendly lunchbag for our son. we're going to be using use washable, reusable & bpa-free lunch containers instead of plastic sandwich bags and other plastic containers. I think your "going back to school green" is a great place to get ideas! As for me and my girls,,,,, Throughout the year I save sturdy pieces of cardboard, the kind like gift and cereal boxes are made from. My girls will decorate them with recycled clothing material, old greeting cards, stickers..... I then cover them with recycled clear plastic. I use double-sided clear heat and bond strips. We get cute folders made this way. i send them off with lunch in a reusable bag and aluminum reusable drinking bottles. Other than that we recycle with special emphasis on stuff brought back from school that we may not need. and we look for cool bags that are organic or recycled like cool backpacks from inhabitots!!!! we recently purchased containers for my daughters lunchbox, all containers are eco friendly and reuseable. there will be no garbage (aside from food waiste) coming form my daughters lunch no packaging! Last year, my kids were constantly losing their lunchboxes-my husband got so fed up, he started packing their lunches in brown bags. Well, this year, their lunch bags clip onto their backpacks! No more lost lunchbags and no more wasteful brown bags! one thing that we have done since she started school is reuse whatever supplies possible from the previous years. one thing that i have discovered recently that i am going to start this year is packing her bento box lunches. this is one of the neatest ideas i have seen and she is just as excited about it as i am. no more plastic baggies and such. also for drinks i usually send reuseable water bottles. always use reusable non-BPA bottles and containers for snacks/meals. A bento box has been the ideal purchase this summer to get my daughter organized for school. No more waste! We are also going to be donating a full sized composter so the children can start composting their lunch leftovers for a planned community garden. (It's a rural school so we definitely have room for a composter or two in the back corner of the playground) Thank you for creating the give away and managing such a valuable site for parents like us. I pack the kids' lunch in a brown paper bag inside a lunch sack, and when they finish eating they put the food scraps back in the bag and bring them home for composting! We homeschool which cuts down on emissions from daily travel back and forth to school. My grandchildren are learning to do so much more than we did while my kids were growing up. My daughter-in-law and son all have water bottles, reuseable lunch containers, etc. Two of the children are very involved in Soccer and they use these things for going to the games, taking snacks for the other two who go to watch their other siblings, etc. They "repurpose" their outgrown clothing each year...One granddaughter has a sister of a friend in another state and hers goes there; any that don't have a specific person to pass them on to give the clothes to charity. My daughter in law is going to work part time at her son's preschool so there won't be any extra driving there. The one green thing that we're doing is carpooling to school. Thanks! I'm sending my daughter to school with an eco friendly lunchbox and reusable snack bags. She uses a stainless steel water bottle and wax paper baggies rather than plastic. I'm planning to introduce the school to eco friendly cleaning supplies in the classrooms. I use tupperware instead of plastic bags, I add a thermos instead of bottled water, and I add a linen napkin instead of a paper one. I subscribed! We're doing a few things to be a little greener (and save money too!) Since my husband just works a few blocks away, he's started riding his bike instead of driving. We're recycling more and living more frugally, within our means! I've also changed our lightbulbs to high-efficiency. Thank you fo the giveaway! We are using the new "lunch" kits with all re-useable items. My only concern is that they will lose the pieces before the end of the year! My daughter is starting preschool, and I hope to send her with a backpack and school supplies made from recycled materials. Also, when it comes time to donate items for the classroom, I'll choose items with recycled content (tissues made with recycled paper, for example). Finally, parents are required to volunteer some time/labor for the school. I'm hoping to use my time to insert some green into school operations (e.g. talk about green office supplies and cleaning products, introduce some native plants if asked to work on the landscaping, etc.). Well first of all i like the backpacks that yall are giving away they are so cute especially the dog. For school i use paper bags to put my daughter lunch in and this will help out alot. Thanks for the opportunity to enter this sweepstakes. I didn't even know there was a separate newsletter for inhabitots. Now I'm on the list. We're greening up back-to-school by walking or biking to school every day, and we're striving for trash-free lunches. This means no single serving snacks. The lunchbox contains lunch in reusable containers (no ziplocks), cloth napkin, and fork/spoon in a small utensil holder. Since the little guy is on a growth spurt, there's not even any food waste. Those containers come back empty, to be washed and used again. We are using ecofriendly sippy cups and bento boxes which in not only green but makes drinking and eating fun! We use reusable lunchboxes and juice containers in place of ziploc bags. We are sending my 1st grader to school with a reusable water bottle this year instead of disposable juice boxes. We will be growing our own organic garden, from that we will use the produce in our lunches, and we will be making our own reusable cloth bags. Green is our future, we all can make a difference. Here in Hong Kong, most people school buy lunch from the school canteen and the food is usually served in plastic plates and cutlery. Well I bring my lunch from home everyday in a reusable plastic container, along with my food I drink water from my reusable water bottle. Cheers, B.
I am trying to go as green as possible with everything from buying organic clothes, to shoes from Simple Shoes (they use recycled and organic products) and a lot of hand me downs (older cousins help with that as well! :-)). I bought 4 flats of local organic rasberries which I've now made into rasberry jam, ready for those school lunches in our non-toxic and reuseable lunch bag. He doesn't have school supplies yet (Kindergarten) but at home I try to buy all non-toxic supplies and paper with as high a recycle content I can find. i subscribe. I'm packing my son's lunch in reuseable containers rather than plastic baggies. I like the puppy backpack best. We try to recycle as much as we can our plastic bottles. This is my daughter's first year at school and I am very excited to keep the reduce reuse recycle mantra that is in her home life into her school. So many green options are available for school supplies and homemade yummy healthy lunches will accompany her to class. We do not purchase character laden clothes and instead shop consignment or locally made. We reuse as much as we can. We have taught our children that last years school supplies are just as good to use for the next year. They learn to take care of their things this way. We pack lunch everyday and recycle the baggies. I use containers and reusable water bottles. Start the kids early in these practices and it becomes perfectly natural to them. We teach our children to reuse as many of their school supplies as they can. They become active in this process and learn to take care of their things, in order to make them last. We pack lunch everyday. I use containers and reusable water bottles. I wash and reuse plastic baggies when needed. When kids are taught from a young age to participate in these practices, it becomes a perfectly natural process for them. This will be my daughter�s first year at school and I have purchased for her clothes and shoes that have been already been gently worn by another girl. We will be packing lunch and using a re-usable cup for water. Thanks for the giveaway. My daughter likes the panda backpack. We use reusable water bottles and reuse our plastic bags or use tupperware. Instead of wasting paper writing down things on a sheet of paper I'll misplace, I write them on a dry erase board. Then if need be make a recording so I want forget what I need to buy. I am reusing old notebooks for my kids this year. So many notebooks only get a quarter of the way or halfway filled and then just get thrown out! I subscribed too! I signed up for the newsletter. We pack lunches and use a stainless steel water bottle and sandwich holder for them. I subscribe to your newsletter and I am trying to buy as many natural products as I can find. I subscribed and one green thing we do is use tupperware in my sons lunch instead of plastic bags. Thanks for the chance! My newest "green" changes are mostly in the world of soaps (who knew, less suds less dryness in my son's skin!?) and lotions, and of course...he's not quite old enough for school yet- but looking at the school supplies, they make SO MANY notebooks and folders and other supplies from recycled and recyclable materials. They even make them cute and fun for kids now. It's easier to have a green September than some people think! We recycled all school stuff last year. Putting new covers on what we could. I subscribed! We are a little more "greener" this back to school year because we are not buying any pencils/pencil holders/markers/scissors etc. I figure we have enough stuff to get them through another year without buying new stuff! My kiddo is still small and still in diapers. She's starting Mother's Day Out this fall. I'm trying to convince them that cloth diapers aren't scary. I subscribe to the newsletter. what I am doing green is I am using a lunch box instead of a paper or plastic bag and have all recycled paper notebooks. To help the planet we use mostly all reusable household items including diapers, wipes, un-paper towels, pads, dishware, utensils, napkins, etc. Were buying all the green school supplies we can. Recyclable paper, and pencils. I subscribed. I pack bento or other lunches and use reusable containers rather than disposable. We're using cloth snack bags, or at least reusing ziploc baggies by washing and drying them! This will be my son's first year in school so I am still learning what must be done! We bought an organic cotton lunchsack and plan to pack lunches with no waste. We are buying used clothing and organic clothing. We are currently seeking an eco-friendly backpack, so I hope he wins one! I signed up for your newsletter and we are buying green products (recycled, etc) for all our back to school supplies! I am going to pack my child's lunch using reusable containers. We were using paper bags and plastic sandwich bags. Now we've gone to a lunch sack and all reusable containers. We are going to use reusable container for lunch. I've stopped using so many Ziploc baggies for snacks & use more re-usuable containers. And instead of buying individual packs of milk, I use a Thermos Funtainer for my kids. we use re-useable plastic containers for lunches -extra bonus - things don't get mushed ! We use notebooks with recycled paper. I have always tried to use as many reusable items as I can. My kids are really getting into it this year they tried to find as many recycled school supplies as they could when we went shopping, and even reused some supplies from last year. I bought a bento box lunch pack (wonderful laptop lunches!) this summer so no more hideous ziploc bags for a sandwich so my son will say hello to fun lunches from now on! Amazing how we can be creative with a bento box.. Welcome healthy & earthy salads! Send your kids back to school in eco-friendly style with a super cute Ecozoo backpack! 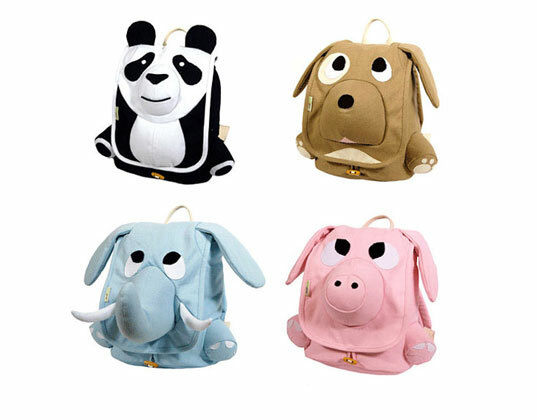 The winner will receive his/her choice of one Ecozoo backpack -- either the elephant, pig, panda, or puppy. (Valued at $29.99) All creatures are made of 100% organic cotton canvas and feature padded straps and internal pockets. Read more about why the adorable Ecozoo series offers the best green, non-toxic backpack for your child!